Aerial of Short Street in 1917. This podcast episode discusses the history of a unique street in downtown Miami that was given the nickname of Short Street by early Miami pioneers. Its formal name was originally Avenue A, but given its span of only two-blocks, it was much shorter than the other avenues that were laid out during the incorporation of the city of Miami. 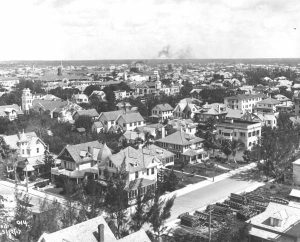 Short Street was the centerpiece of Miami’s first upscale residential area. Many early Miami pioneers built fine homes along the avenue and adjacent streets. However, by the mid-1910s, the area around Short Street began a slow conversion to a hotel and commercial center. The homes began to disappear over time and the once prominent residential street was forgotten. Tune into this week’s podcast episode to hear more about historic Short Street and the project to restore it to a prominent thoroughfare in downtown Miami. The project is called Avenue 3 and it hopes to make NE Third Avenue, aka Short Street, into a pedestrian-friendly corridor similar to Miami Beach’s Espanola Way or Coral Gable’s Giralda Avenue. Cover: Aerial of Short Street in 1917. Courtesy of Florida Memory.